Nick joined the School in January 2008. He completed his under-graduate degree (Human Movement Studies) and PhD at Leeds Metropolitan University, UK. His first post-doctoral position was at Liverpool Hope University College, UK where he lectured in Exercise Science (1997-2001). 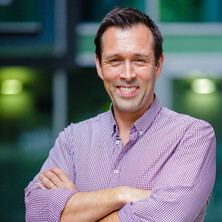 Prior to moving to UQ he was a Senior and Principal Lecturer in Exercise Science and Health within the Carnegie Faculty, Leeds Metropolitan University. Nick's research has dealt with young people and adults and concerns multi-disciplinary issues in physical activity, exercise and health. He has a specific interest in the measurement of physical activity, as well as intervention strategies that impact behaviour change and physiological/psycho-social health indicators. Recent work has included funded, national and international studies in Europe, Australia and Latin America , with particular emphasis on physical activity in the workplace. Nick is an active member of a number of physical activity networks and associations and is lead researcher for the International Universities Walking Project, a global collaboration of universities aiming to integrate walking into employee work practices. He also regularly presents at international conferences, reviews for international journals and supervises PhD and other post-graduate projects. Can a workplace 'sit less, move more' programme help Spanish office employees achieve physical activity targets? Which population groups are most unaware of CVD risks associated with sitting time? Does the use of standing 'hot' desks change sedentary work time in an open plan office? Does physical activity impact on presenteeism and other indicators of workplace wellbeing? Gilson, N., McKenna, J. and Cooke C. (2008) Experiences of route and task-based walking in a university community: qualitative perspectives in a randomized control trial. Journal of Physical Activity and Health, 5 Sup. 1: S172-S178. Gilson, N. D. (2004) A case for intervention? Physical activity behaviour in an urban sample of middle-to-high income Northeast Mexicans. Promotion and Education, 11 3: 150-152. Gilson, N. D. (2003) Contemporary physical activity. Promotion and Education, 10 2: 63-65. Chau, Josephine Y., Engelen, Lina, Kolbe-Alexander, Tracy, Young, Sarah, Olsen, Heidi, Burton, Nicola, Gilson, Nicholas, Bauman, Adrian and Brown, Wendy (2018). Who is responsible for activity-promoting workplaces? Australian management perspectives from multiple industries. In: Abstracts for the 7th Congress of International Society for Physical Activity and Health. 7th Congress of the International Society for Physical Activity and Health, London, England, (S157-S157). October 15-17, 2018. A 5-months workplace pedometer-based intervention: did it change employees' sedentary behaviour 2 months after removal? Is too much sitting really bad for health and what can be done about it? Gilson, N. and Ryde, G. (2009). Walk@Work: A web-based tool to support workplace walking. In: C. Finch, Journal of Science and Medicine in Sport (Supplement) Program and Abstracts - be active '09. 2009 Australian Conference of Science and Medicine in Sport - be active '09, Brisbane, (191). 14-17 October, 2009. McKenna, J., Puig-Ribera, A., Gilson, N. and Brown, W. (2009). What stops employees increasing step counts? A qualitative approach within a randomised controlled trial. In: Stuart Biddle, Georgia Guldan, Kim Gans, Kylie Ball, Maria Daniel Almeida, Pedro Teixeira and Simone French, 2009 Annual Conference of the ISBNPA Abstracts. 2009 Annual Conference of the ISBNPA, Lisbon, Portugal, (27-28). 17-29 June, 2009. Puig-Ribera, A., McKenna, J. and Gilson, N. (2008). A Work Limitations Questionnaire (WLQ) for use with Catalan employees: Linguistic adaptation and validation. In: van Mechelen, W. and Kohl, B., 2nd International Conference on Physical Activity and Public Health Programme & Abstracts. 2nd International Conference on Physical Activity and Public Health, Amsterdam, The Netherlands, (165). 13-16 April, 2008. Puig-Ribera, A., McKenna, J., Gilson, N. and Brown, W. (2008). Change in workday step counts, wellbeing and job performance in Catalan university employees: A randomized controlled trial. In: W. van Mechelen and B. Kohl, 2nd International Conference on Physical Activity and Public Health Programme & Abstracts. 2nd International Conference on Physical Activity and Public Health, Amsterdam, The Netherlands, (165-165). 13-16 April, 2008. Brown, W., Coward, E., Gilson, N. and McKenna, J. (2008). Physical infrastructure and workplace walking in an Australian university campus. In: Proceedings of: 2008 ASICS Conference of Science and Medicine in Sport. 2008 ASICS Conference of Science and Medicine in Sport, Hamilton Island, Australia, (). 16-18 October 2008. Gilson, N., Brown, W., Faulkner, G., McKenna, J., Murphy, M., Pringle, A., Poper, K., Puig-Ribera, A. and Stathi, A. (2008). The International Universities Walking Project: Development on an intervention framework through the Delphi Technique. In: W. van Mechelen and B. Kohl, 2nd International Conference on Physical Activity and Public Health Programme & Abstracts. 2nd International Conference on Physical Activity and Public Health, Amsterdam, The Netherlands, (58-58). 13-16 April, 2008. Greatwood, H., Pringle, A., Gilson, N. and McKenna, J. (2008). The effect of motivational-interviews on the physical activity engagement and change in completers. In: J. Cook, Journal of Science and Medicine in Sport (Supplement). 2008 ASICS Conference of Science and Medicine in Sport: Program and Abstracts, Hamilton Island, QLD, Australia, (19). 16-18 October, 2008. Pringle, A. R., Gilson, N. D., McKenna, J., Cooke, C. B. and Rivett, M. (2007). An Evaluation of Community Interventions and their Impact on Moderate Physical Activity (MPA). In: American College of Sports Medicine 54th Annual Meeting, New Orleans, (S197-S197). 30 May - 2 June, 2007. McKenna, Jim, Gilson, Nicholas and Cooke, Carlton (2007). Qualitative Perceptions of Work Performance Following a University Walking Intervention. In: American College of Sports Medicine 54th Annual Meeting, New Orleans, (S193). 30 May - 2 June, 2007. Brown, Wendy J, Gilson, Nicholas, McKenna, Jim and Ribera, Anna Puig (2007). The International University Walking Project: Comparison of Step Counts and Sitting Times at Different Sites. In: American College of Sports Medicine, New Orleans, (S327-S327). 30 may – 2 June, 2007. Puig-Ribera, Anna, Gilson, Nicholas, McKenna, Jim and Brown, Wendy (2007). Walking Towards Well-being and Job Performance in a University Community: Preliminary Analyses of Baseline Data. In: American College of Sports Medicine 54th Annual Meeting, New Orleans, (S193-S193). 30 may – 2 June, 2007. Cooke, Carlton B, Gilson, Nicholas and McKenna, Jim (2007). Walking and Work Performance in a University Community: A Feasibility Study. In: American College of Sports Medicine 54th Annual Meeting, New Orleans, (S194). 30 May – 2 June 2007. Gilson, Nicholas, McKenna, Jim, Cooke, Carlton and Brown, Wendy (2007). Walking towards health in a university community: The impact of campus location on walking interventions. In: Proceedings of: 7th International Conference on Walking and Liveable Communities. Walk21-VII, The Next Steps, The 7th International Conference on Walking and Liveable Communities, Melbourne, Vic, Australia, (). 23-25 October, 2006. Gilson, Nicholas D., McKenna, Jim, Cooke, Carlton and Brown, Wendy (2006). Walking Towards Health in a University Community: Preliminary Analyses of Baseline Data. In: Medicine and Science in Sports and Exercise. , , (S368-S369). .
Gilson, Nicholas D., McKenna, Jim, Cooke, Carlton and Brown, Wendy (2006). Walking towards health in a university community: Preliminary analyses of baseline data. In: J. L. Durstine, Medicine and Science in Sports and Exercise: Supplement and Final Program. ACSM 2006: American College of Sports Medicine 53rd Annual Meeting, Denver, CO, U.S.A., (S368-S369). 31 May-3 June, 2006. Gilson, Nicholas D. (2005). Physical Activity And Health-related Risk Factors In Mexicans. In: American College of Sports Medicine 54th Annual Meeting, Nashville, USA, (S321-S322). June, 2005.